The FZ09/MT09 is a fun and sporty bike. Journalists and enthusiasts all over the globe have raved about the fun and torquey nature of the 847cc inline-three engine. Aside from having loads of low-end torque, three-cylinder engines are arguably the best sounding engine configuration you’ll find on a motorcycle. Unfortunately, Yamaha equipped the FZ09/MT09 with a super quiet exhaust from the factory and you can barely even hear it at normal speeds. Luckily, the aftermarket is filled with companies who offer high-quality exhaust systems which not only sound awesome but add power when combined with a high-quality tuning solution. Here are the best MT09 exhaust systems on the market. This list is in no particular order and all the exhaust will fit any 2014 – current FZ09 or MT09. These exhausts will also fit Tracer 900 and XSR900. Akrapovic has long been a leader in the high-end exhaust market. Their products are on the expensive side, however, they offer incredible quality with great sound-engineering. For the MT09 they offer three different exhaust systems. The first system uses a carbon fiber muffler with a small loop under the bike. They make this system from stainless steel and it’s the cheapest of all three Akrapovic exhaust systems. The second exhaust system uses a full titanium muffler without the small loop under the bike. This version is our favorite thanks to its awesome race looks and titanium construction. Like the carbon fiber version, the titanium muffler version uses a stainless steel header and mid-pipe. The third exhaust system from Akrapovic uses is of a blend of the first two. This version is very similar to the titanium muffler version, except with a carbon fiber cap on the titanium muffler. The shape and design of the muffler is also slightly different. This version is the most expensive of all three, but it arguably looks the best. Each Akrapovic system is lighter than the stock exhaust and offers a very clean exhaust note. Even with the baffle in, this exhaust sounds fantastic. Compared to other aftermarket exhausts, it’s relatively quiet, but removing the baffle is easy and makes it louder. Second on our list is is the R-77 exhaust from Yoshimura. Yoshi is one of the go-to exhaust companies for Japanese bikes and for the FZ09 they two different R-77 exhaust systems. They make the header and mid-pipe of both exhausts from high-quality stainless steel. The difference is the muffler. You can opt for a full carbon fiber muffler or a stainless steel muffler with a carbon fiber cap on the end. Both versions of the R-77 are lighter than the stock exhaust and much louder. This exhaust is louder than the Akrapovic exhaust, and it’s especially loud with the baffle removed. 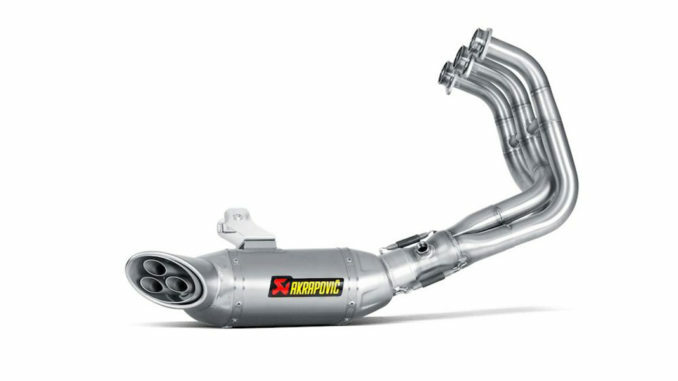 Both R-77 systems can typically be found cheaper than the Akrapovic exhaust systems, but the prices are relatively close. You may have noticed one constant throughout all these exhaust systems: the location of the muffler. While many bikes used to have large mufflers under the passenger pegs, modern bikes like the FZ09/MT09 have the muffler under the bike, with the exit of the muffler just past the foot peg on the right side. If you’re a fan of the older style exhaust systems, the LeoVince GP Dual Exhaust is perfect for you. They construct this exhaust system from high quality stainless steel and features a thermoceramic finish. The two large mufflers are finished in blacked for a stealthy look. The classic design of this exhaust system is especially good looking on the retro XSR900, but it definitely looks very cool on the FZ09. For those who want the lightest exhaust possible, Graves is definitely the way to go. Way Akrapovic offers two exhaust systems with titanium mufflers, Graves offers a full titanium exhaust. By using thin-walled titanium tubing, Graves managed to make their entire exhaust system weigh 6.4lbs, nearly 12lbs lighter than stock! Not only is it significantly lighter than stock, it’s lighter than every other aftermarket exhaust on this list. For those who just want the sound of an exhaust market exhaust without spending a bunch of money, a slip on exhaust is the way to go. Unfortunately, the OEM exhaust on the FZ09 and MT09 use a one piece construction, which means traditional slip on systems aren’t an option. This M4 “slip-on” exhaust is quite a bit cheaper than any other exhaust on this list, however, it requires you to chop up your stock exhaust for installation. On top of the complicated install, the performance benefits are negligible and likely not measurable. This exhaust really just offers sound, but basically no performance. That’s fine if you just want the sound and you’re happy with the performance of your bike. Compared to the other exhaust systems on this list, the M4 slip-on is significantly cheaper. You may be wondering if you need a tune after you install your fancy new aftermarket exhaust. With the increased flow of an aftermarket exhaust, many enthusiasts claim the bike will run lean and eventually explode. While this is partially true, the need for a tune depends on the exhaust system. All exhaust systems for the FZ09 and MT09 work best with a tune and provide much more power. In fact, without a tune, it’s possible to see an overall decrease in power after you install an aftermarket exhaust. Interestingly enough, the Akrapovic Titanium exhaust is the only full exhaust on the market which is marketed to be safe on the OEM tune. The validity of this claim varies depending who you ask. Mostly, it’s safe to run your bike for a short period (a few weeks at most) without a tune. With a tune, the bike won’t run as lean, the throttle will be smoother, and it will decrease the insane amount of backfires.